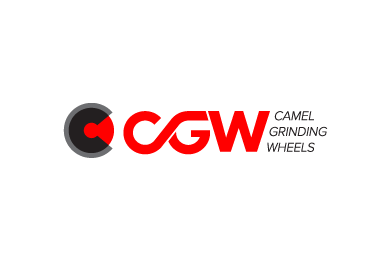 CGW's advanced abrasive technology based on years of experience and ongoing research insures our unconditionally commitment to innovation and to the quality and safety of our products. Bonded abrasives are made by incorporating abrasives grains into a matrix, which can be resin and fillers or vitreous materials. Usually, such abrasives contain porosity which helps to control the thermal aspects of the process. Type of article to be ground and materials: Nickel alloy blade, metal cylinder etc. Type of abrasive grain needed: Aluminum oxide, boron nitride etc. Type of specific physical property: porous, compacted etc. Type of bonding: verified, resin etc. Type of fabrication process: Cold or hot press etc. 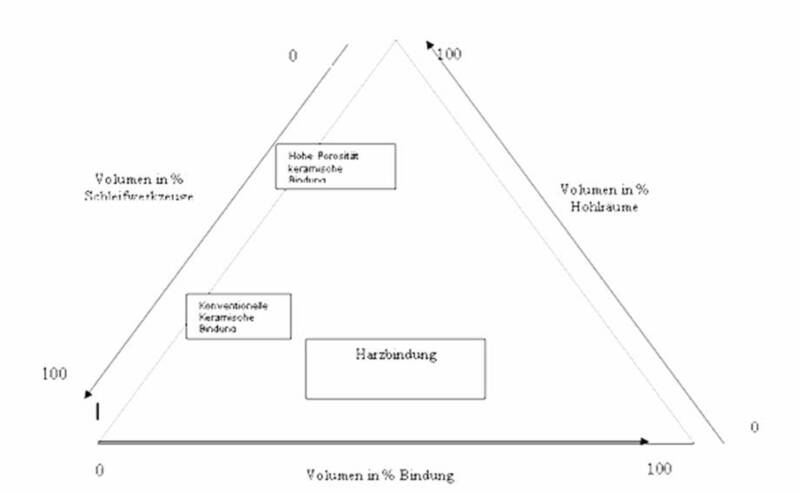 Each axis represents 100% of one component with the opposite side corresponding to 0% and intermediate percentages represented by the fractional distance from the side to the axis. Actual wheels compositions do not cover the whole composition range represented by the phase diagram but are restricted to a limit range by technological and practical factors. consistent and cost-effective. Some physical properties of the most important abrasives materials are Summarized in Table 1. The characteristics of the grains as size, shape, strength, friability are important and control the wheel's performance as the matrix material. Fused Aluminum Oxide and its derivatives: Aluminum Oxide is derived from Bauxite in an industrial high-energy process. During the melting stage the crystalline structure as well as the chemistry can be controlled and results in pure crystal Aluminum oxide, white fused Aluminum oxide (low Iron and Silica content), Semi-friable Aluminum oxide (low titania levels), Monocrystalline Aluminum oxide (strong cutting edges and a high compressive strength) and Red and Pink Aluminum Oxide (high Chrome levels). Applications: For grinding high tensile strength materials, as well as rough grinding , deburring, snagging, cutting and fettling of low-alloy, ferrous materials (Regular Aluminum Oxide). For grinding hardened and high alloy steels up to 62 Rc (White Aluminum Oxide). For high-alloy steels, grinding operations with high form and dimensional accuracy requirements (Monocrystalline Aluminum oxide). Aluminum Oxide-Zirconia: The production of aluminum-oxide Zirconia grains involves similar equipment and process to that of standard Aluminum Oxide. The presence of Zirconia phase and its crystal size can improve the toughness of the grain compared to white or brown Aluminum Oxide. Applications: Used in steel mills and foundries. Sol-Gel Aluminum Oxide and derivatives: Aluminum Oxide produced by the sol-gel technique has very fine crystals and therefore retains sharp cutting edge as the material wear. One of the disadvantages of the Sol-gel Aluminum Oxide is it low thermal stability with respect to fused Aluminum Oxide. Applications: Used on both ferrous and non-ferrous materials. Silicon Carbide: The material is harder than Aluminum Oxide, but it is usually much more friable. The manufacturing process makes controlled use of high energy to obtain green or black silicon carbide. The black silicon carbide has a higher impurity content than the green grain. Applications: For grinding low tensile materials like cast iron, non-ferrous and non-metallic. 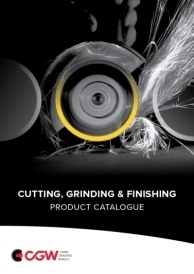 Resin based: Phenolic thermosetting resins are still by far the most important organic bonds for grinding and cutting wheels. The properties of the bond can be varied to give elastic or thermal properties by incorporating plasticizers or fillers. Compared to vitrified wheels, resin-bonded wheels are much more resistant to shock and loading and heavy-duty use. They are therefore, more popular in snagging operations and for cut-off wheels where uncontrolled lateral stresses can be very high. When extremely high strength is required, for example in high-speed operations (>100 meter per second surface speed), then the resin may be further reinforce with glass fiber. 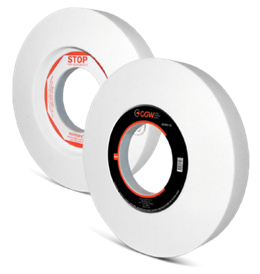 There are limitations, however, in terms of temperature that can be permitted at grinding/cutting surface. Also, resins wheels can be attacked by alkaline grinding fluids.